Exhibited alongside work from a carefully selected group of contemporary makers, a ground breaking collaboration between Textiles and Architecture students is on show at Dorset’s only Arts Council-funded crafts centre, Walford Mill Crafts in Wimborne, as part of the Textile Textures exhibition. The project is the result of a three-week residency in which four first year students from Arts University Bournemouth (AUB) – two from BA Textiles and two from BA Architecture – worked together to produce a collective response to the aesthetics of the Mill building, which dates from around 1760. The installation, Passing It On, is an assembly of large panels with layered components that combine experimental 2D and 3D drawings, as well as photographs, that have been worked with stitch, collage, origami and cut-through. Also on show are the many drawings, photos, samples and experiments that chart the group’s progress from initial inspiration to final delivery. Having found common ground in the idea of altering the notion that weeds, moss and fungi are undesirable outcomes of decay in aged buildings, the students worked in two groups, with the results of first group’s week-long exploration of Walford Mill being developed by the second group in Week Two of the residency before both groups worked together in the final week. “This has been a really exciting project,” says Textiles student Ana Clark. “To be able to work with a student from another creative discipline has been an eye-opening experience and the Mill has provided an excellent environment to develop a collaborative project. There is a wonderful feeling of inclusion and a creative feeling that has definitely informed the way we worked. During the residency the students spent time with guest mentors Adam Zombory-Moldovan, whose plans to extend and upgrade Walford Mill Crafts were granted planning permission some years ago; Dr Nicola Thomas from the University of Exeter; and furniture-maker Karen Hansen. A key part of the project was the opportunity for the students to trade tools and materials – architects using needle and thread, textile artists utilising straight lines and matchsticks so that industrial architectural equipment was used in combination with intricate stitchwork and natural materials including moss and pieces of wood. Support from the Walford Mill Education Trust and the Elmgrant Trust made the students’ residency possible. 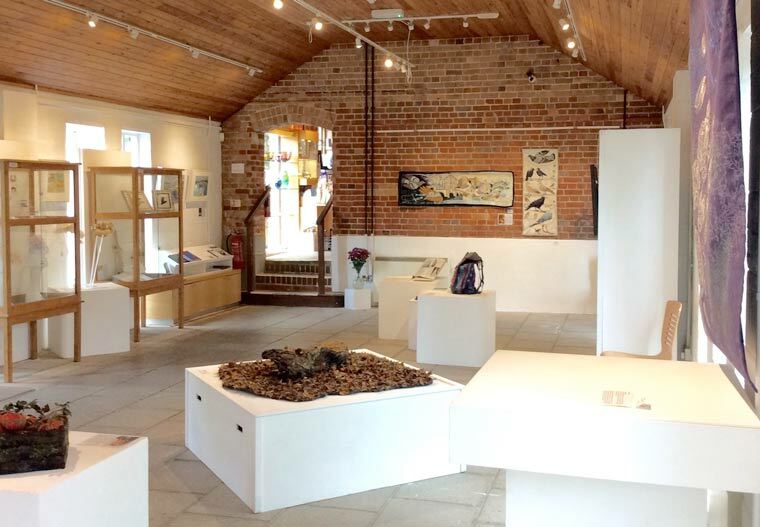 “The Textile Textures exhibition gives textiles a voice that refines surface textures and colour,” says curator Christine Fletcher-Jones, joint CEO Walford Mill Crafts. “It has been incredibly exciting to have the AUB students working here. Their energy, talent and enthusiasm have been an inspiration, but they have also benefitted from the wealth of experience and skill of our resident makers.